Vegan lentil wraps made with a fresh salad, and dill yogurt sauce. Cook the lentils in the vegetable broth until they're soft and tender. You might need to add more water while cooking. To make the salad, chop all vegetables, add olive oil, lemon and season with salt. Give it a good mix. For the yogurt sauce, mix the yogurt with garlic, dill and salt. 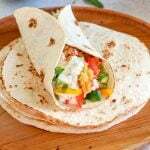 Assemble the wrap by adding the salad first, then lentils and top with yogurt sauce.